Make a statement with your hanging basket or bird feeder using this Erva Black Twisted Forged Wall Bracket. The hardy construction, classic design, and black color of this unit lend a traditional hint to your wall, and it easily showcases a hanging accent. Square bar, iron construction creates a strong hanger, and its body arches upward from your wall for interest. The unit culminates in a few twists on the body and an upward curl, accommodating decorations up to 41" in diameter. A 3.5" long tail on the bracket, as well as a 2" square back plate and included screws, keep this item securely mounted to your wall. Crafted from hand forged iron and sporting a classic black finish, this hanger will withstand seasons of use indoors or outside. 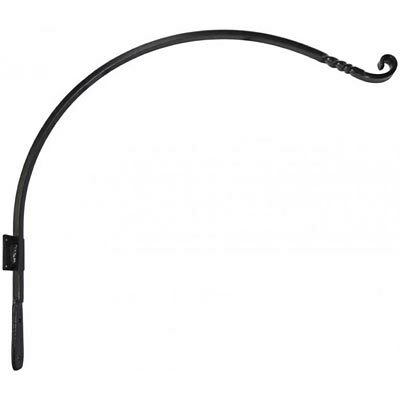 Add a dramatic hanging item to your patio or deck wall using this Black Twisted Forged Wall Bracket. Made in the USA.